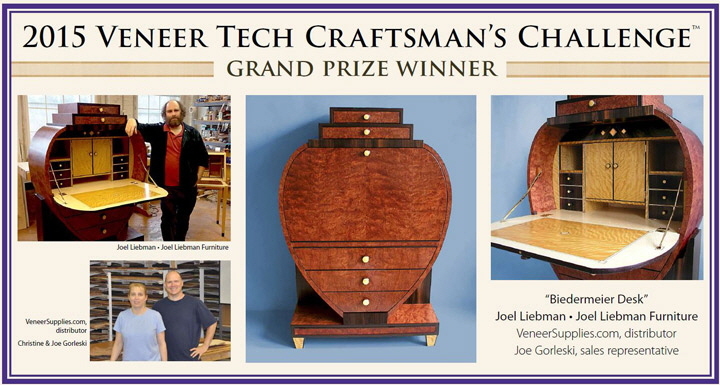 Joel Liebman of Joel Liebman Furniture in Easthampton, Massachusetts, earned the grand prize in the 2015 Veneer Tech Craftsman's Challenge with his interpretation of an 1830 Biedermeier desk. Judges also issued awards in the annual contest for top veneer work in architectural millwork, cabinetry, furniture, student work, and specialty items. Awards were announced July 23 at the AWFS Fair. Liebman said his top winning desk came about from a customer request. "The client found a photo in a magazine of an 1830 Biedermeier desk that she admired," he said. "She contacted me and asked if I could make my interpretation of the design. This desk is made of bubinga, ebony, satinwood, wenge, birdseye maple and solid brass. The curved sides of the desk are made with a technique called bent lamination. Veneer gave a stunning appearance, where solid could not have been used." Your artistry and craftsmanship are more than first class. We would have never persisted and pursued you in the first place had we not seen this. Right from the beginning we knew you were making not just furniture but museum pieces. Bravo Joel Liebman, you deserve all the praise!! Mazel Tov! It's a well deserved honor and recognition. Congrats! Your work is amazing! Well deserved! Congrats! You deserve it, your work is fantastic!